Hanridh® Marketing Consultants presents a 3 month English certificate course for those who wish to speak English with confidence. Students here would be trained by Mrs. Asha Kapoor (M.A., M.Ed.) who has over 41 years of experience in the field of languages. 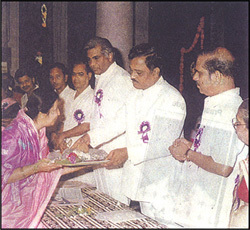 Her accolades in this profession include being awarded the Governor's Award and Mayor's Award in the field of education. Led by such an eminent educationist, this English certificate course covers an all-round skill improvement in reading, writing, and speaking of English. Typically, the course is conducted for 12 Wednesdays from the time of enrolment, once a week from 5:30 pm to 7:30 pm at the premises of Hanridh Marketing Consultants. 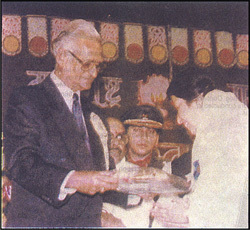 Mrs. Asha Kapoor being awarded The Mayor's Award for 'Best Teacher' in 1991. Fees for 3-month course would be 9,900 (Nine Thousand Nine Hundred only) per person. Total fees for the course would have to be paid at the beginning of the course. Training Venue : Hanridh Marketing Consultants Pvt. Ltd.
Next to Samsika Marketing Consultants Pvt. Ltd.
Hanridh ® Marketing Consultants awards certificates to candidates on successful completion of the course.